Nip Benchmark is located on the southern fringe of the Salmon River Mountains, just north of Stanley Idaho. This is a quick hike up an old jeep road that offers up spectacular views of the Sawtooths on the other side of the valley. The trailhead is located on Nip and Tuck Road, about three-quarters of a mile from Lower Stanley. Doing this hike at sunrise is highly recommended, when the lighting really accentuates the views of the Sawtooths. My wife and I were on an anniversary getaway weekend to Stanley. She likes to sleep a little later than me, and I was hoping for a quick morning hike. So after a 10 minute drive to the trailhead, I was hiking by 6:15am. It was a little chilly, but the steep jeep trail helped me warm up quickly. Once I crested the ridge at about 6300’, I was met with amazing in-your-face views of the Sawtooths being touched by the first rays of sun. It was very cool. The hike itself went quickly, with the only thing slowing me down was stopping to gawk at the views. On the way up the trail, I saw an elk and a spruce grouse, and lots of tracks and sign. The summit was in a lightly wooded area just off the trail. There I found the benchmark from 1957, and a triangulation stand, which was in pretty good shape. After a quick detour to the east for some better views, it was time to head down. The descent didn’t take long, other than stopping for more gawking. I was back to the motel by 8:15, including a quick stop at the Stanley Bakery to pick up a mocha and some sweets for my sweetie pie. 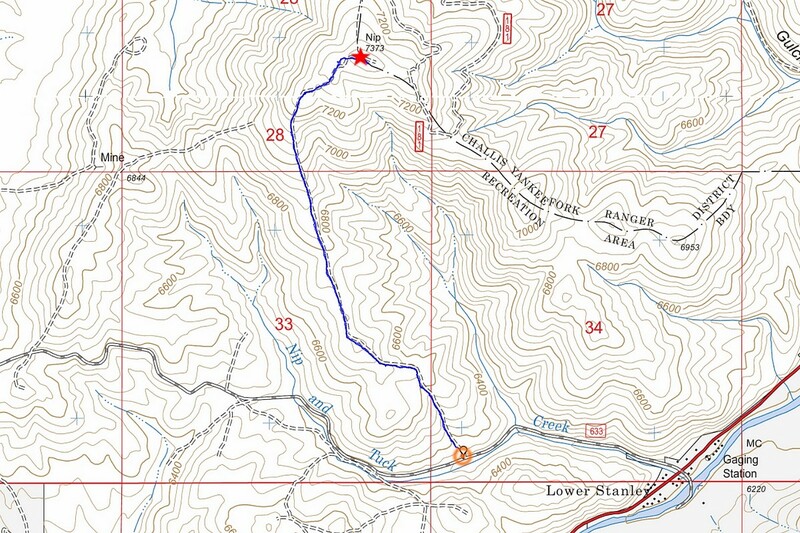 Map of the route, just over 3.5 miles and 1100' elevation gain round trip. First view of the Sawtooths. Summit benchmark and old triangulation stand. Me on the summit of Nip Benchmark. Great view of the Sawtooths during the descent. Looking back on the summit of Nip Benchmark. Nip Benchmark from the gas station in Stanley.